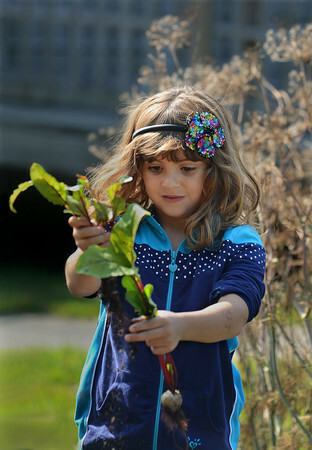 Second grader Ashlee Scola takes a look at a beet that she just pulled from the ground during a Harvest Day activity Tuesday at Beeman Memorial Elementary School in Gloucester. Students harvested crops they had planted earlier in the year, including potatos, beats, beans and squash. The program is a project of the Backyard Growers organization directed by Lara Lepionka.